Here's my take on Sketch 248 at Pencillines. I really do like their sketches, and I often go there for inspiration, but I rarely ever participate in the actual challenges. Well, it's never to late to start, is it? Here's my gorgeous boy again. He has developed far more attitude lately than ever before, and it's a struggle sometimes. But I guess it's an age thing. Thankfully, I can still tickle it out of him. LOL. You are right to participate in our challenge, your LO is very beautiful! Thanks for playing along with us at Pencil Lines! 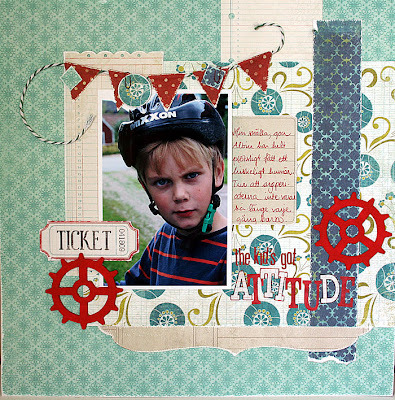 What a lovely and sweet boy´s layout,love it! !